Beth Dooley: Sweet -- Peas and Radishes! Sweet -- Peas and Radishes! Sweet Pea, that's what my dad called me, a term of endearment or sometimes a chide. No wonder, sweet peas are the darlings of spring vegetables, and how frustrating it is to wait for the local varieties to come in. Plant them now (if you haven't already), they begin to take root even through the snow and cold and they grow quickly and delicately, climbing up towards the sun. 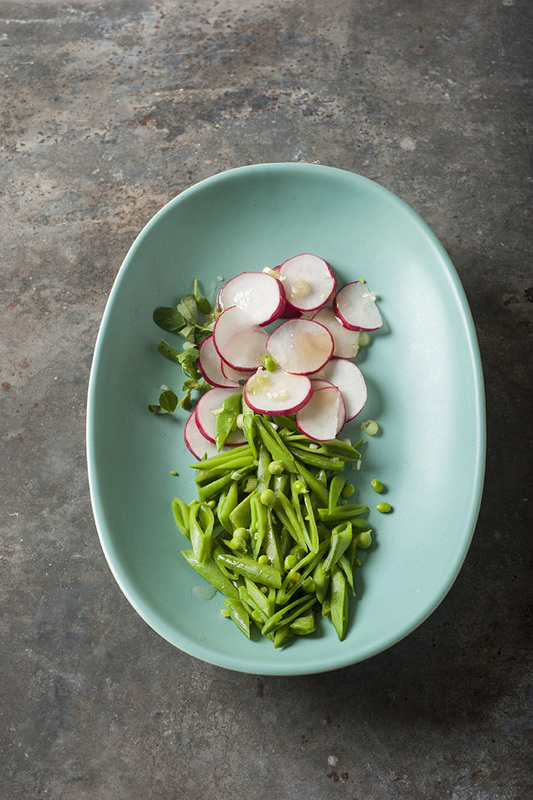 This simple salad of crisp, crunchy radishes and crisp peas comes together in a snap. Save the extra dressing for basting grilled chicken or fish. It will keep in a jar for a week. In a small bowl, whisk together the soy sauce, vinegar, garlic, ginger and honey, then slowly whisk in the light and dark sesame oil. Bring a medium pot of water to a rapid boil. Blanch the peas until they turn brilliant green, about 30 seconds, then drain and run under very cold water. Lightly pat dry with a clean towel. Arrange the peas and the radishes on a large serving plate and drizzle the dressing overall. Serve cold or at room temperature. Can't wait to give this one a try, Beth! What a lovely springtime salad. Hi X, How are you? Thank You Very Much For Create That Nice & Cool Article.